Apollo is the Olympian god of light, youth, beauty, and prophesy in Greek myth. One of his mighty deeds was to slay the serpent Python, an oracle of the pre-Olympian chthonic religion, at the Omphalos, near Delphi. After wresting control of the oracle, he bestowed the art of prophecy upon one of his priestesses and named her Pythia. To mark this feat, Apollo created the Pythian Games, held every four years. Today we have these games again as the Olympic Games. 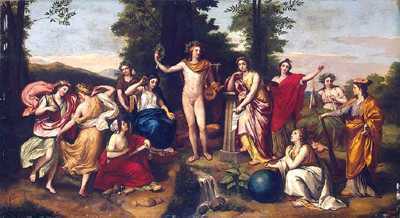 Apollo, god of Light, was the son of Zeus and Leto. He was the twin brother of Artemis, the Huntress, lady of the wild things, and goddess of the Moon. The stories of the cosmic gods have shaped our culture, our literature, our art and even our religion. A portion of our heritage from the distant past, they form as important a part of our intellectual life as they did of that of the people among whom they originated. This is the sixth of a series of Old Greek Stories by James Baldwin, which will be added to in weeks ahead. Long before you or I or anybody else can remember, there lived with the Mighty Folk on the mountain top a fair and gentle lady named Leto. So fair and gentle was she that Jupiter loved her and made her his wife. But when Juno, the queen of earth and sky, heard of this, she was very angry; and she drove Leto down from the mountain and bade all things great and small refuse to help her. So Leto fled like a wild deer from land to land and could find no place in which to rest. She could not stop, for then the ground would quake under her feet, and the stones would cry out, “Go on! go on!” and birds and beasts and trees and men would join in the cry; and no one in all the wide land took pity on her. One day she came to the sea, and as she fled along the beach she lifted up her hands and called aloud to great Neptune to help her. Neptune, the king of the sea, heard her and was kind to her. He sent a huge fish, called a dolphin, to bear her away from the cruel land; and the fish, with Leto sitting on his broad back, swam through the waves to Delos, a little island which lay floating on top of the water like a boat. There the gentle lady found rest and a home; for the place belonged to Neptune, and the words of cruel Juno were not obeyed there. Neptune put four marble pillars under the island so that it should rest firm upon them; and then he chained it fast, with great chains which reached to the bottom of the sea, so that the waves might never move it. By and by twin babes were born to Leto in Delos. One was a boy whom she called Apollo, the other a girl whom she named Artemis, or Diana. When the news of their birth was carried to Jupiter and the Mighty Folk on the mountain top, all the world was glad. The sun danced on the waters, and singing swans flew seven times round the island of Delos. The moon stooped to kiss the babes in their cradle; and Juno forgot her anger, and bade all things on the earth and in the sky be kind to Leto. The two children grew very fast. Apollo became tall and strong and graceful; his face was as bright as the sunbeams; and he carried joy and gladness with him wherever he went. Jupiter gave him a pair of swans and a golden chariot, which bore him over sea and land wherever he wanted to go; and he gave him a lyre on which he played the sweetest music that was ever heard, and a silver bow with sharp arrows which never missed the mark. When Apollo went out into the world, and men came to know about him, he was called by some the Bringer of Light, by others the Master of Song, and by still others the Lord of the Silver Bow. Diana was tall and graceful, too, and very handsome. She liked to wander in the woods with her maids, who were called nymphs; she took kind care of the timid deer and the helpless creatures which live among the trees; and she delighted in hunting wolves and bears and other savage beasts. She was loved and feared in every land, and Jupiter made her the queen of the green woods and the chase. The servants did as they were bidden, and carried the eagles to the outermost edges of the world. Then Jupiter clapped his hands. The lightning flashed, the thunder rolled, and the two swift birds were set free. One of them flew straight back towards the west, the other flew straight back towards the east; and no arrow ever sped faster from the bow than did these two birds from the hands of those who had held them. On and on they went like shooting stars rushing to meet each other; and Jupiter and all his mighty company sat amid the clouds and watched their flight. Nearer and nearer they came, but they swerved not to the right nor to the left. Nearer and nearer–and then with a crash like the meeting of two ships at sea, the eagles came together in mid-air and fell dead to the ground. They had fallen on the top of a mountain in Greece which men have ever since called Parnassus. So Apollo went down to Parnassus, and looked about for a spot in which to lay the foundations of his house. The mountain itself was savage and wild, and the valley below it was lonely and dark. The few people who lived there kept themselves hidden among the rocks as if in dread of some great danger. They told Apollo that near the foot of the mountain where the steep cliff seemed to be split in two there lived a huge serpent called the Python. This serpent often seized sheep and cattle, and sometimes even men and women and children, and carried them up to his dreadful den and devoured them. “Can no one kill this beast?” said Apollo. Then Apollo with his silver bow in his hands went up towards the place where the Python lay. The monster had worn great paths through the grass and among the rocks, and his lair was not hard to find. When he caught sight of Apollo, he uncoiled himself, and came out to meet him. The bright prince saw the creature’s glaring eyes and blood-red mouth, and heard the rush of his scaly body over the stones. He fitted an arrow to his bow, and stood still. The Python saw that his foe was no common man, and turned to flee. Then the arrow sped from the bow–and the monster was dead. “Here I will build my house,” said Apollo. Close to the foot of the steep cliff, and beneath the spot where Jupiter’s eagles had fallen, he laid the foundations; and soon where had been the lair of the Python, the white walls of Apollo’s temple arose among the rocks. Then the poor people of the land came and built their houses near by; and Apollo lived among them many years, and taught them to be gentle and wise, and showed them how to be happy. The mountain was no longer savage and wild, but was a place of music and song; the valley was no longer dark and lonely, but was filled with beauty and light. “What shall we call our city?” the people asked. In the Vale of Tempe, which lies far north of Delphi, there lived a young girl whose name was Daphne. She was a strange child, wild and shy as a fawn, and as fleet of foot as the deer that feed on the plains. But she was as fair and good as a day in June, and none could know her but to love her. One day when the sun shone warm, and the air was filled with the perfume of flowers, Daphne wandered farther away from the river than she had ever gone before. She passed through a shady wood and climbed a hill, from the top of which she could see Father Peneus lying white and clear and smiling in the valley below. Beyond her were other hills, and then the green slopes and wooded top of great Mount Ossa. Ah, if she could only climb to the summit of Ossa, she might have a view of the sea, and of other mountains close by, and of the twin peaks of Mount Parnassus, far, far to the south! The river smiled, and Daphne ran onward, climbing one hill after another, and wondering why the great mountain seemed still so far away. By and by she came to the foot of a wooded slope where there was a pretty waterfall and the ground was bespangled with thousands of beautiful flowers; and she sat down there a moment to rest. Then from the grove on the hilltop above her, came the sound of the loveliest music she had ever heard. She stood up and listened. Some one was playing on a lyre, and some one was singing. She was frightened; and still the music was so charming that she could not run away. Then, all at once, the sound ceased, and a young man, tall and fair and with a face as bright as the morning sun, came down the hillside towards her. “Daphne!” he said; but she did not stop to hear. She turned and fled like a frightened deer, back towards the Vale of Tempe. “Daphne!” cried the young man. She did not know that it was Apollo, the Lord of the Silver Bow; she only knew that the stranger was following her, and she ran as fast as her fleet feet could carry her. No young man had ever spoken to her before, and the sound of his voice filled her heart with fear. Then it seemed as though the river rose up to meet her. The air was filled with a blinding mist. 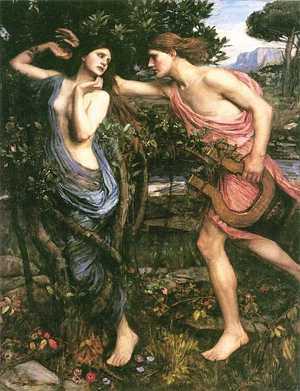 For a moment Apollo lost sight of the fleeing maiden. Then he saw her close by the river’s bank, and so near to him that her long hair, streaming behind her, brushed his cheek. He thought that she was about to leap into the rushing, roaring waters, and he reached out his hands to save her. But it was not the fair, timid Daphne that he caught in his arms; it was the trunk of a laurel tree, its green leaves trembling in the breeze. Whether Daphne had really been turned into a tree, I know not; nor does it matter now–it was so long ago. But Apollo believed that it was so, and hence he made a wreath of the laurel leaves and set it on his head like a crown, and said that he would wear it always in memory of the lovely maiden. And ever after that, the laurel was Apollo’s favorite tree, and, even to this day, poets and musicians are crowned with its leaves. Apollo did not care to live much of the time with his mighty kinsfolk on the mountain top. He liked better to go about from place to place and from land to land, seeing people at their work and making their lives happy. When men first saw his fair boyish face and his soft white hands, they sneered and said he was only an idle, good-for-nothing fellow. But when they heard him speak, they were so charmed that they stood, spellbound, to listen; and ever after that they made his words their law. They wondered how it was that he was so wise; for it seemed to them that he did nothing but stroll about, playing on his wonderful lyre and looking at the trees and blossoms and birds and bees. But when any of them were sick they came to him, and he told them what to find in plants or stones or brooks that would heal them and make them strong again. They noticed that he did not grow old, as others did, but that he was always young and fair; and, even after he had gone away,–they knew not how, nor whither,–it seemed as though the earth were a brighter and sweeter place to live in than it had been before his coming. In a mountain village beyond the Vale of Tempe, there lived a beautiful lady named Coronis. When Apollo saw her, he loved her and made her his wife; and for a long time the two lived together, and were happy. By and by a babe was born to them,–a boy with the most wonderful eyes that anybody ever saw,–and they named him Æsculapius. Then the mountains and the woods were filled with the music of Apollo’s lyre, and even the Mighty Folk on the mountain top were glad. One day Apollo left Coronis and her child, and went on a journey to visit his favorite home on Mount Parnassus. For Apollo had a pet crow which was very wise, and could talk. The bird was not black, like the crows which you have seen, but as white as snow. Men say that all crows were white until that time, but I doubt whether anybody knows. Apollo’s crow was a great tattler, and did not always tell the truth. It would see the beginning of something, and then, without waiting to know anything more about it, would hurry off and make up a great story about it. But there was no one else to carry news from Coronis to Apollo; for, as you know, there were no postmen in those days, and there was not a telegraph wire in the whole world. One day, however, it had a different story. It came much earlier than ever before, and seemed to be in great haste. “Cor–Cor–Cor!” it cried; but it was so out of breath that it could not speak her whole name. “She does not love you! 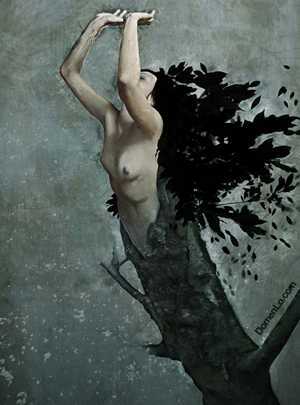 she does not love you!” cried the crow. “I saw a man–I saw a man,–” and then, without stopping to take breath, or to finish the story, it flew up into the air, and hurried homeward again. Apollo, who had always been so wise, was now almost as foolish as his crow. He fancied that Coronis had really deserted him for another man, and his mind was filled with grief and rage. With his silver bow in his hands he started at once for his home. He did not stop to speak with any one; he had made up his mind to learn the truth for himself. His swan-team and his golden chariot were not at hand–for, now that he was living with men, he must travel like men. The journey had to be made on foot, and it was no short journey in those days when there were no roads. But after a time, he came to the village where he had lived happily for so many years, and soon he saw his own house half-hidden among the dark-leaved olive trees. In another minute he would know whether the crow had told him the truth. He heard the footsteps of some one running in the grove. He caught a glimpse of a white robe among the trees. He felt sure that this was the man whom the crow had seen, and that he was trying to run away. He fitted an arrow to his bow quickly. He drew the string. Twang! And the arrow which never missed sped like a flash of light through the air. Apollo heard a sharp, wild cry of pain; and he bounded forward through the grove. There, stretched dying on the grass, he saw his dear Coronis. She had seen him coming, and was running gladly to greet him, when the cruel arrow pierced her heart. Apollo was overcome with grief. He took her form in his arms, and tried to call her back to life again. But it was all in vain. She could only whisper his name, and then she was dead. A moment afterwards the crow alighted on one of the trees near by. “Cor–Cor–Cor,” it began; for it wanted now to finish its story. But Apollo bade it begone. Soon after this, Apollo took the little Æsculapius in his arms and carried him to a wise old schoolmaster named Cheiron, who lived in a cave under the gray cliffs of a mountain close by the sea. And Æsculapius proved to be a wise child, gentle and sweet and teachable; and among all the pupils of Cheiron he was the best loved. He learned the lore of the mountains, the woods, and the fields. He found out what virtue there is in herbs and flowers and senseless stones; and he studied the habits of birds and beasts and men. But above all he became skillful in dressing wounds and healing diseases; and to this day physicians remember and honor him as the first and greatest of their craft. When he grew up to manhood his name was heard in every land, and people blessed him because he was the friend of life and the foe of death. As time went by, Æsculapius cured so many people and saved so many lives that Pluto, the pale-faced king of the Lower World, became alarmed. And he sent word to his brother Jupiter, and complained that Æsculapius was cheating him out of what was his due. Great Jupiter listened to his complaint, and stood up among the storm clouds, and hurled his thunderbolts at Æsculapius until the great physician was cruelly slain. Then all the world was filled with grief, and even the beasts and the trees and the stones wept because the friend of life was no more. When Apollo heard of the death of his son, his grief and wrath were terrible. He could not do anything against Jupiter and Pluto, for they were stronger than he; but he went down into the smithy of Vulcan, underneath the smoking mountains, and slew the giant smiths who had made the deadly thunderbolts. Then Jupiter, in his turn, was angry, and ordered Apollo to come before him and be punished for what he had done. He took away his bow and arrows and his wonderful lyre and all his beauty of form and feature; and after that Jupiter clothed him in the rags of a beggar and drove him down from the mountain, and told him that he should never come back nor be himself again until he had served some man a whole year as a slave. And so Apollo went out, alone and friendless, into the world; and no one who saw him would have dreamed that he was once the sun-bright Lord of the Silver Bow. This is the end of this chapter. Tune in soon for Admetis and Alcestis and more Old Greek Stories, by James Baldwin! Return to the start of Old Greek Stories, by James Baldwin.